Used by the Defence Force Air Command. 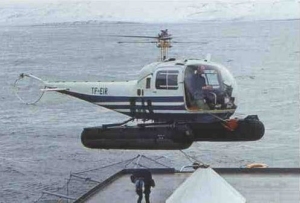 One Bell 47J-2A obtained in 1965. It crashed on 9 October 1971, but was presumably repaired. Two OH-13S (Bell 47G) obtained in 1973. First example withdrawn 1984 and became G-BJFI, second example withdrawn 8 December 1980 and became G-WYTE. All used for liaison/light transport. TF-HUG 3173 63-13763 1973 OH-13S/Bell 47G-2A, CAA No.226. damaged landing aboard CG cutter Aegir, wfu 1984. To G-BJFI. TF-MUN 3294 64-15426 1973 OH-13S/Bell 47G-2A, CAA No.236. wfu 8 Dec 1980. To G-WYTE. At least three Bell 212 obtained from the USA by 2004. Used by ? Squadron for transport duties. The supply of eight AH-1E and six TAH-1P was approved by the US Congress in February 1994. A deal for the supply of eight ex-US Army AH-1E was signed in May 1994, with deliveries begining late in 1994. An additional four AH-1E were acquired in 1995, bringing the total acquired to 12. Used by the 8th and 10th Squadrons for anti-armour duties. (Six “AH-1P” were reportedly approved in January 1995 and ten AH-1E in October 1995. A total of 24 AH-1E and six TAH-1P were reportedly delivered. There is no evidence that these proposed transfers took place. 17 ex-US Army AH-1F were reportedly approved in 2001 for delivery in 2003). Nine AH-1F were delivered in April 2005.